Sony India is on a mission to revive the magic of pure sound and also re-establish itself as the definitive brand for music. With the tagline ‘Upgrade Your Ears’, the brand is positioning its new range of Audio Devices including Headphones, Speakers and Home Theatre Systems as the best in class, offering uncompromising clarity of sound. 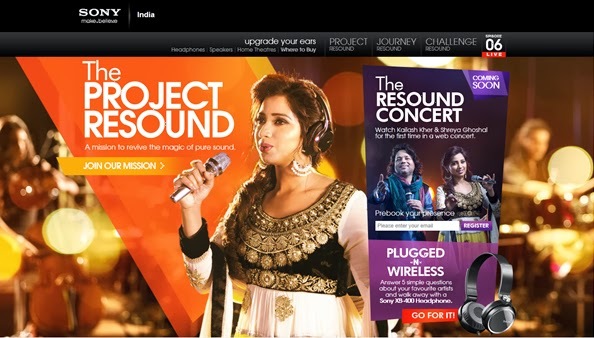 The new campaign includes a web-hosted initiative called ‘Project Resound’, front-lined by Shreya Ghoshal and Kailash Kher. The project microsite targeted at music enthusiasts takes fans on a quest for pure music through a superb web video series. The well cut and produced 5-6 minute video episodes profile the process of creating new sounds and music by celebrity singers Shreya Ghoshal and Kailash Kher. The conversational and easy content makes for an interesting watch. There are new episodes every few days that further the story and will eventually culminate into a web concert where the singers will debut the single they have been working on especially for Project Resound. Fans can share their email addresses to pre-book their presence at the web concert or to keep themselves updated on the latest videos. The episodes are available on Sony India’s Youtube page. The visually striking and feature rich microsite also lets fans tweet their feedback directly from the pages with #projectresound hashtag and also like & share content. The Plugged-n-Wireless contest is a simple quiz, based on celeb intro videos with a chance to win new Sony XB-400 headphones. This is an exceptional campaign from concept to execution. Haven’t seen big promotions yet except for promoted tweets every few days. Waiting to check out the Jukebox and the web concert soon.